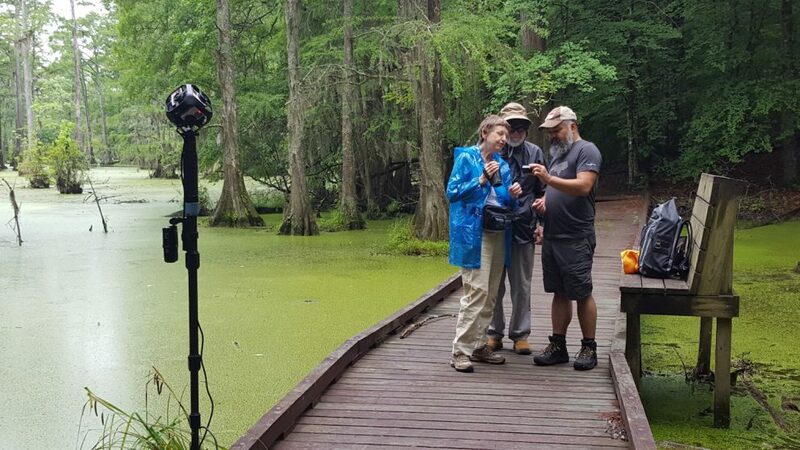 Arthur Earnest collaborates with Betty Black and Hal Heatwole at the Merchants Millpond 360° video shoot for BIO 181. After wrapping up three video shoots at different locations across North Carolina, DELTA’s project team shared their experiences as well as the future vision of immersive experience and story-based learning in 360° environments. The three video shoots were part of a DELTA Exploratory Grant that aimed to give Introductory Biology: Ecology, Evolution and Biodiversity (BIO 181) students an immersive experience with real-world environments through the development of interactive 360° videos. Biology faculty Betty Black, Miriam Ferzli and Lisa Paciulli sought DELTA’s help to immerse students in field-based experiences where they find and observe organisms in their natural habitats. Since May, two other locations have been explored and immersive 360° video captured. The DELTA project team included Creative Director Mike Cuales; Instructional Designer Taylor Dawson; Video Producer Arthur Earnest; and Director of Instructional Innovation Services David Howard. In addition to the project team, the crew at each shoot included faculty members and assistants. Shackleford Banks is a barrier island on the coast near Beaufort, North Carolina, and the location for the second shoot. In addition to the 360° video of the environment, Cuales and Earnest shot traditional video of specific organisms. In late June, the project team visited Merchants Millpond in Gatesville, North Carolina, for the final video shoot. 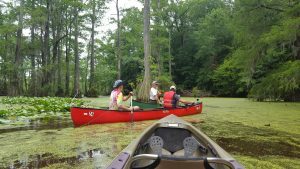 A ranger, who had been working for many years at Merchants Millpond, joined the team and was instrumental in helping the crew identify certain organisms. The last two locations added diverse environments and new content to the course that were not previously available. According to Cuales and Earnest, carrying the gear around each site proved to be challenging. However, as they discovered ways to improve the process, they agreed it was much easier by the last site visit. The technology and equipment itself also posed a challenge due to limited battery life. 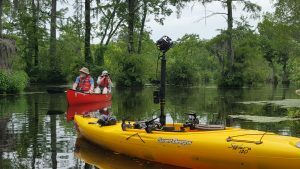 Capturing Merchants Millpond using the GoPro Omni 360° video system and custom built kayak rig. Cuales explained the difficulty of rigging and properly securing a kayak for the Merchants Millpond shoot. The team had one kayak dedicated to equipment that was pulled around the pond. When thinking about what the team would have done differently, Howard said he would have liked to have an expert like the ranger at Merchants Millpond at each location. In addition, Cuales added they would equip each expert with a microphone to capture their expertise. Howard also would suggest renting a boat at Shackleford Banks to span the full length of the island and video as much as possible. According to the project team, planning is essential. The faculty members had to determine exactly what was important to capture, while Cuales and Earnest planned where to put the 360° camera to capture essential content. After the production phase, the team had to create the immersive virtual reality (VR) experience from the multiple pieces of content at each shoot. In addition, the faculty members had to provide traditional video of organisms to embed into the 360° video. The world of VR is constantly changing and evolving. Initially, the team explored a range of platforms including VIAR360, Unity and Unreal Engine but used WondaVR for its initial release. According to Cuales, this was due to cross-platform/device compatibility while also allowing for browser/web-based distribution. “The platforms are ongoing and the features are always changing. The more people experience the project, the more we will know how it is working or not working,” he added. 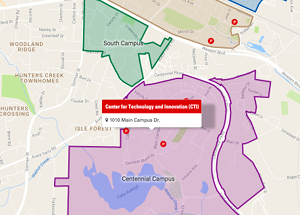 Starting this fall, all three faculty members will use the new content in different ways. The immersive experiences will be available to view via a VR headset and a desktop/laptop version. While the experiences will be the same, the different versions allow students to view the content in a way that is most comfortable and accessible. David Howard and Arthur Earnest are led by the ranger at Merchants Millpond. Ferzli teaches in a SCALE-UP classroom designed to promote active learning, and she intends to give students VR headsets and do activities in class based on the content. Paciulli teaches in a large face-to-face lecture-style classroom. Her students will have access to both versions but will likely use the content for homework assignments. Black teaches in an online and distance education version of the course and will use the desktop and laptop version of the content for assignments as well. Observing the user experience is important for DELTA to see how the content is received and how it will work for students. According to Cuales, since it is early in the realm of integrating VR into real-world environments, it is vital to see how students interact with the content to see what works and what they may find challenging. Observing Ferzli’s classroom sessions will not only allow for improvements but also to see how campus wireless adapts to as many as 100 students using headsets and accessing the content. Between BIO 181 and a previous DELTA Grant for Fire Ecology, DELTA has a collection of unique 360° video content from across North Carolina. “The content could be reused to develop stories and immersive experiences for any science-based learning,” said Cuales. The collection is very valuable as it can tell other stories and be used in a variety of ways. For DELTA, the BIO 181 project gave an insight to the future of story-based learning and opportunities to try different approaches to storytelling in a 360° environment, an aspect that is still being explored. With the best practices learned in this experience, DELTA plans to continue to integrate virtual reality and innovate technologies to ultimately impact student success and enhance the user’s experience.